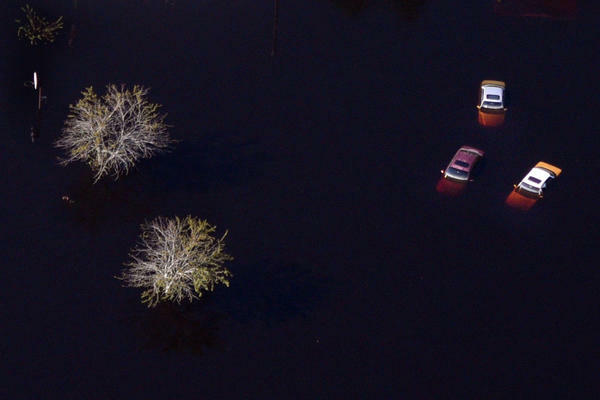 Aerial views of flooding and submerged cars from Hurricane Florence in Lumberton, N.C.
A disabled car is surrounded by floodwaters from Hurricane Florence near the Todd Swamp in Longs, S.C., last week. A car is inundated with floodwaters from Hurricane Florence at an apartment complex at Aberdeen Country Club on Thursday in Longs, S.C.
Simpson returned to her home in New Bern, N.C., after evacuating during the storm to find that her house, flooded with 18 inches, was trashed, and her car was ruined. Her car will join an estimated thousands of others in the Carolinas that have been flooded out by Florence. Those vehicles are now scattered among the streets waiting to be towed, sitting in salvage lots to be auctioned off for parts, or potentially being resold under an illegal guise to trick buyers into purchasing duds. These cars may look fine on the outside, like Simpson's did. But, signs of damage inside and underneath were apparent when her car wouldn't start. The car was considered a total loss by her insurance company. She had just finished paying it off over the summer. "I was like, 'I'm going to drive this until the wheels fall off,' and I guess I did," she said. "Except the water floated the wheels." Many cars that are submerged in floodwaters become undrivable. 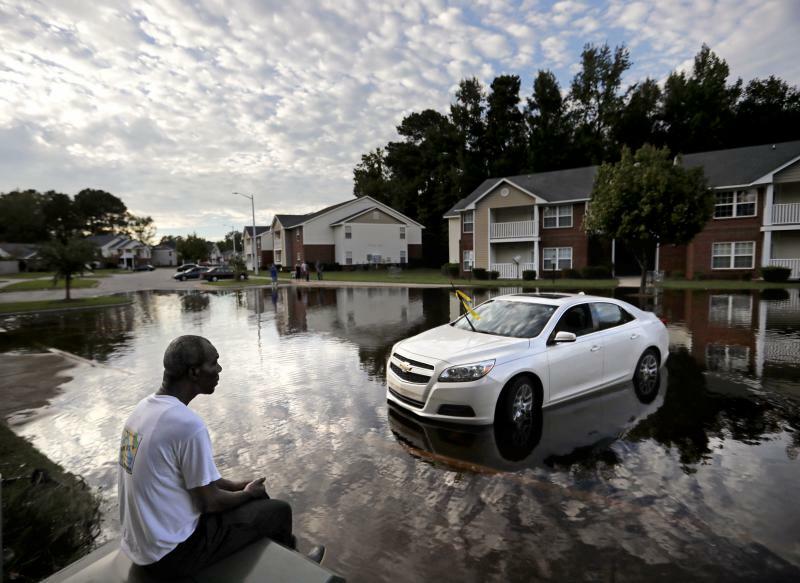 Once the water gets in, it deteriorates electronics over time, according to Todd Frazier, an auto material damage manager for North Carolina Farm Bureau, the fourth-largest auto insurance provider in the state. "Saltwater is very hard on car electronics. 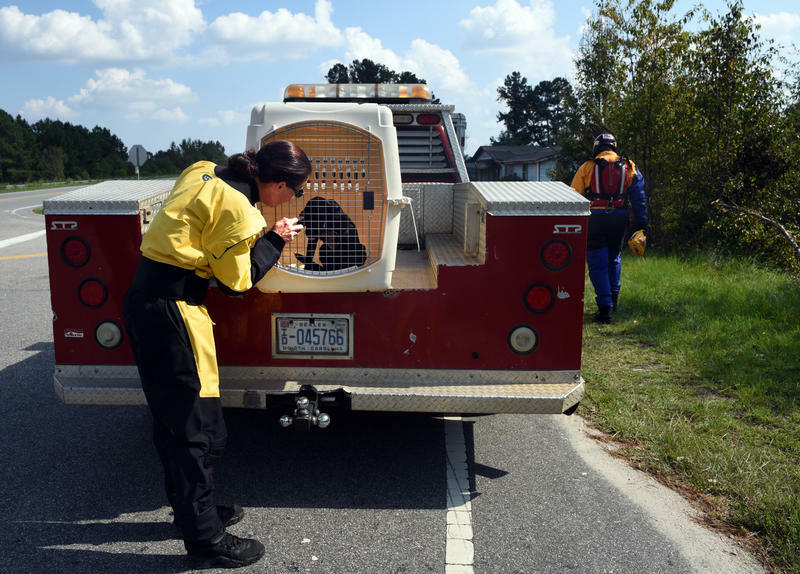 If saltwater gets in there, we generally consider it a total wash," Frazier said. "From the outside, you'd probably never notice it, and from the inside probably not either." Walking up to her car, Simpson said it looked normal, but she knew not to be optimistic. She had seen her neighborhood on the Weather Channel and said it was the worst flooding she had ever witnessed. She knew she would be left without a ride, and she's not the only one. "Wrecker truckers are coming up and down my street every day, every few hours, getting cars," Simpson said. "I know a lot of people are having to get rental cars." The demand for rental cars in her area has grown so large that Simpson said one man she knows from church went to get a rental car and came back with the only car left: a U-Haul truck. Rental cars, Ubers, or depending on others for a lift will be a new reality for some who have lost their cars to Florence floodwaters. Cheyenne Puga, a resident of Wilmington, is likely to be without a car for a while. Currently, her gray 2010 Honda Civic smells of swamp water, but she won't need it to go to her job at Dockside restaurant anytime soon. "It's probably going to be closed for another two weeks. We'll probably be out of work a month," she said. "Financially, that's really going to hit all of us pretty hard." Despite the smell, mud and mess, Puga has remained cautiously optimistic about her car. Unlike Simpson's car, it started. However, the steering alignment is off, the tires are flat, and the car squeaks when she drives. She is hopeful that she can get all of these things repaired. What she doesn't know is whether there is electrical damage. 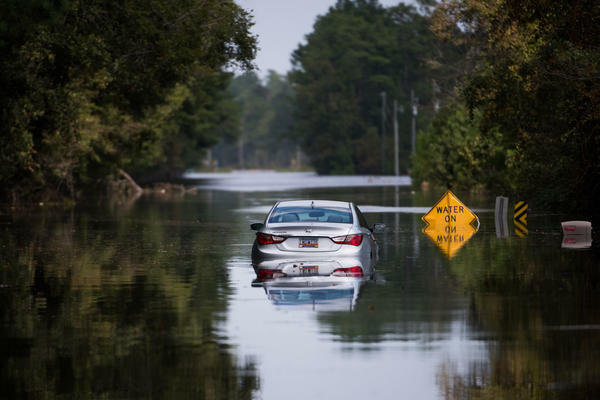 "Sometimes the effects of water damage cannot be seen for months," said Kevin Thompson, the general manager of Harrell's Auto Service in Fayetteville, N.C. "If water goes in, it corrodes the electrical components. It may look good now, but then it starts showing damage. It could take weeks or months. It's not something you can see with the naked eye." At his auto service shop, Thompson has seen lots of cars coming in with water damage from Hurricane Matthew. He expects to get some more from Florence. Almost all are beyond repair. "About 1 percent get repaired," he said. "It depends on how the water got into the front. If there was only a little water in the front of the car, and it's just transmission damage, then possibly. If it's a front-drive vehicle, we can replace the transmission." Most cars have electronic systems underneath the driver's side of the car, Thompson explained. Once the water reaches that area, the electronics are usually damaged. At another shop in town, cars that come in for repairs after hurricanes are typically hydro-locked, meaning the motor won't turn because of water, said James Rodriguez, owner of C&J Tire & Auto Repair. Rodriguez can fix this issue by replacing the motor and transmission on the car. Still, most don't get fixed. "If you've got $15,000-$20,000 worth of damage, then it's totaled. It's not worth it to fix," he said. Jessica Bramlett, co-owner of Titan Recovery, said the New Bern-based towing service company has been averaging 10 cars per day. Each one can take several hours to pick up and bring back to a storage lot. "That's not much compared to some of the bigger companies," she said. However, it's enough to exhaust her drivers, who are sleeping three or four hours a night. When Claude Johnson, the owner of CJ & Son's Towing Services, picked up the phone across town, the fatigue peppered his sentences with long, slow sighs. Johnson's lot for towed cars is currently at about 90 percent capacity. "It's a marathon, not a sprint," he said. "I'm not trying to pull them all at once, there's going to be so many." 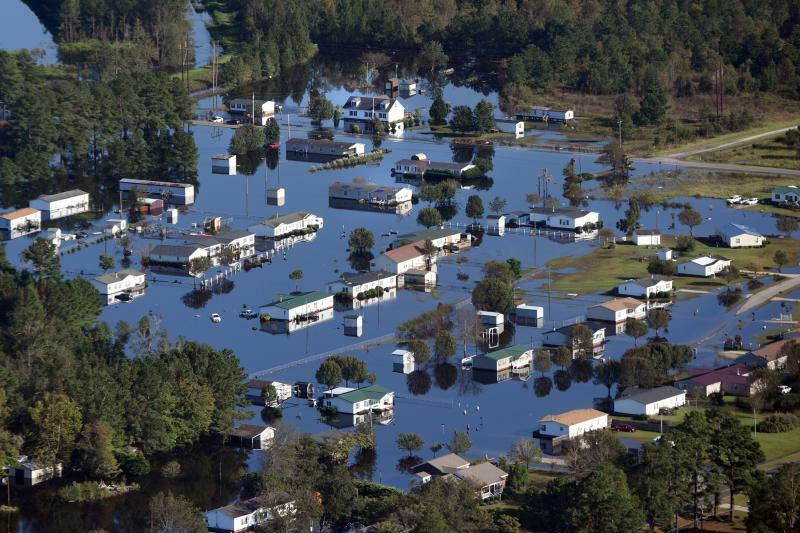 In the span of three days after the storm, North Carolina Farm Bureau received 800 claims of flooded, totaled cars. Frazier said they were still expecting more. The company uses Insurance Auto-Auction to tow the cars, which he said has deployed 1,300 tow trucks to the region. Two of the top largest auto insurance providers in North Carolina did not have specific data for how many claims of flooded cars they are currently processing, but State Farm said it received 2,400 claims from the region relating to Florence in the first week after the storm, and Nationwide said it has more than 1,000 associates working on storm-related claims. Geico, the third-largest auto insurance provider in North Carolina, did not return calls or emails requesting data. While it's hard to get an exact number on the number of cars that have been totaled by storm floodwaters, Frank Scafidi, the director of public affairs for the National Insurance Crime Bureau, said it won't be anywhere near the number from Hurricane Matthew, which gutted the region two years ago. However, the risk of flooded-out cars illegally appearing on used car markets around the country remains prevalent. "It's pretty common after events like this," Scafidi said. "The best way to sell these things is to get as far away as possible." 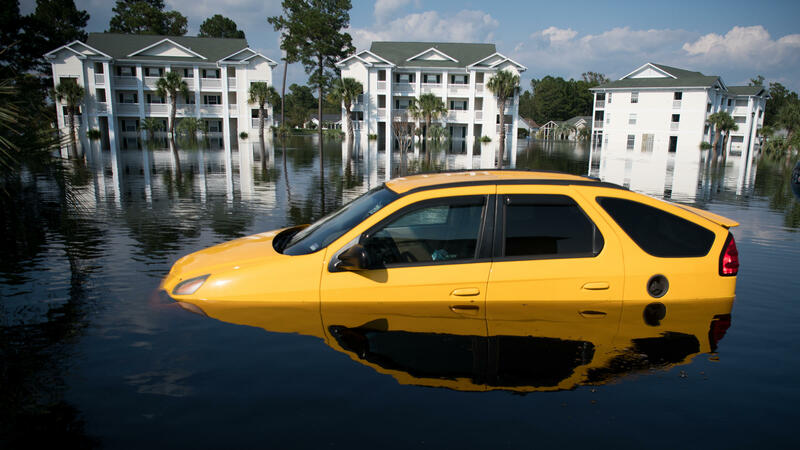 Since Hurricane Katrina, he said, it has become increasingly more difficult to resell flooded cars, thanks to the implementation of the National Motor Vehicle title information system. Insured cars, such as Simpson's or Puga's, are tracked with flood titles that are disclosed in every sale. But uninsured cars that may have been abandoned or junked by the owners can easily be towed away, cleaned and resold with very little evidence that reveals the existing damage on the car. "People buying cars tend to be impressed by a couple things: looks and price," Scafidi said. A car that looks fine and seems like the deal of the century could be a trap. He encouraged buyers to take a deeper look for mud and wastewater residuals in the car, or for telltale signs of prior water damage such as condensation droplets inside the headlights. Above all else, he encouraged paying an auto-technician to inspect any car before purchase. "Paying 100 bucks for their time is better than losing 10 grand," he said. Buyers of bum, water-slogged cars could also lose their life. Last week, Bramlett said her company towed a car that caught fire hours after driving through standing floodwaters, showing exactly what the dangers of driving water-ruined cars can be. It could be several weeks before these types of cars appear on the used vehicle market, and potentially months before local residents are even able to afford replacement cars. As a children's and youth director for Christ Church in New Bern, Simpson said not having a car isn't an option. She needs it for youth and business trips. Coupled with the cost of the damage to her house and loss of almost all her personal belongings, she said she will need to move to a smaller home with cheaper rent in order to buy a new car. Everything she owns was trashed, but still, Simpson considers herself one of the lucky ones. "I know a lot of people that don't have the means that I do to replace their cars," she said. Without the money, some residents will be left waiting for a ride, surrounded by cars that won't take them anywhere.